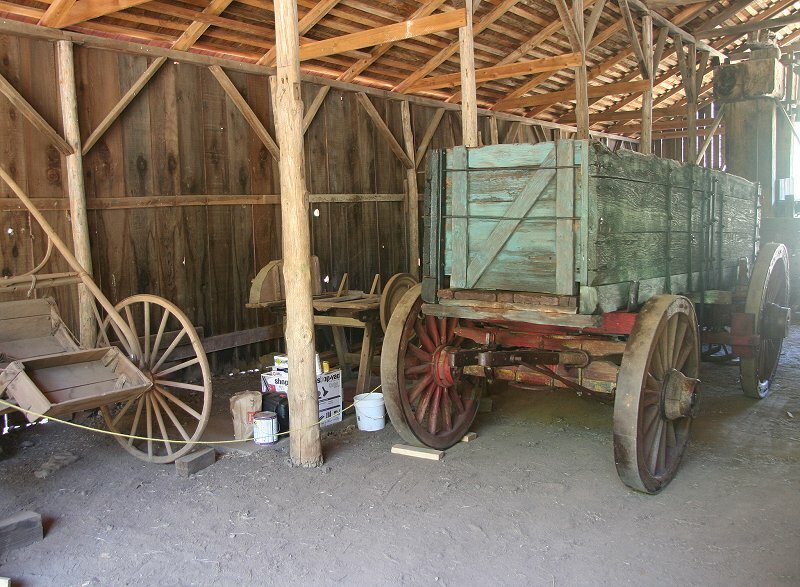 On that Living History Day, thanks to the foresight of Diane Marten, photographs were taken of the two wagons so we now have before and after comparisons of the conservation. What is "conservation" in this sense? From the pictures below I conclude it is somewhere between very careful cleaning, and restoration, with as little restoration as possible so that the conservation is "reversible." 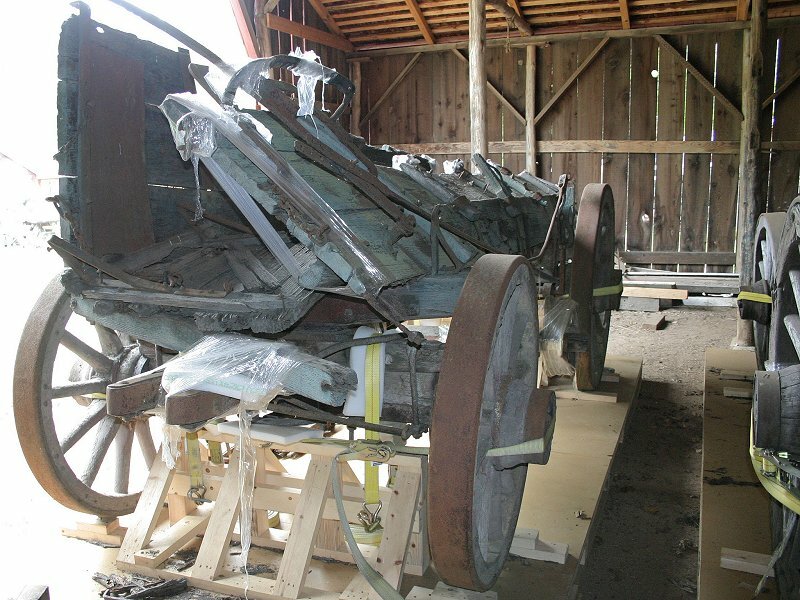 The actual materials and condition of the historic item should be preserved to the extent possible, i.e., "conserved." 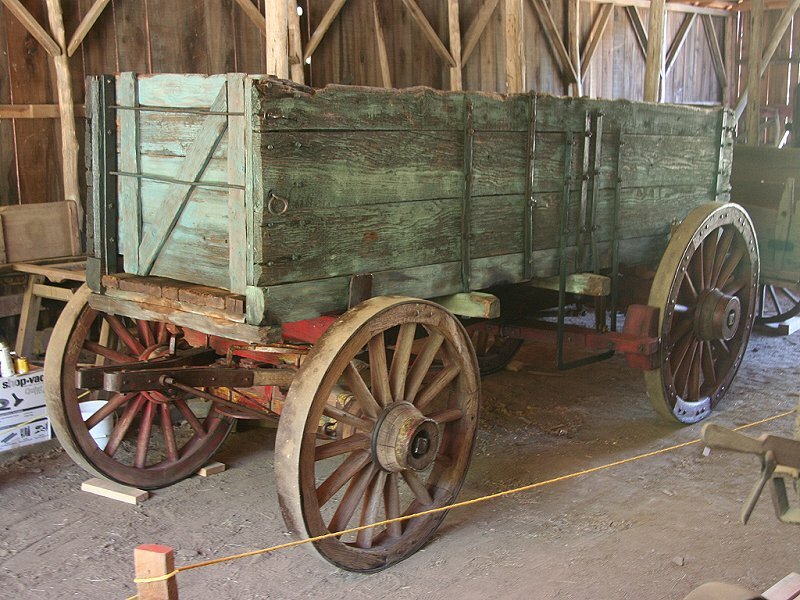 The two freighters are very similar, the most notable difference being that the brake lever is on the left side of the wagon in one and on the right side in the other. I therefore refer to them below as the left-brake freighter and the right-brake freighter. 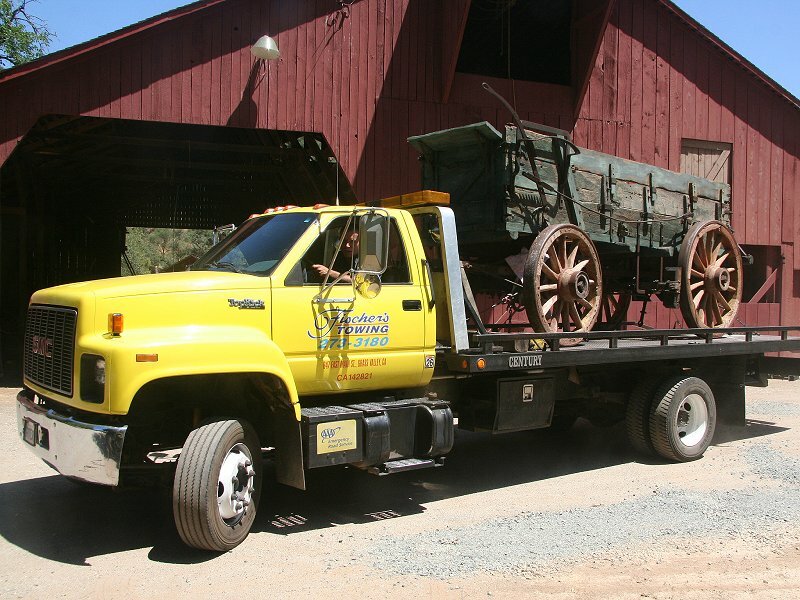 The first picture below is of the right-brake freighter on its pallet for shipment to Pennsylvania for conservation. This freighter was in reasonably good shape, except for layers of dirt and decay, brake shoes so damaged they were wrapped in plastic, and some broken boards and bend rods. 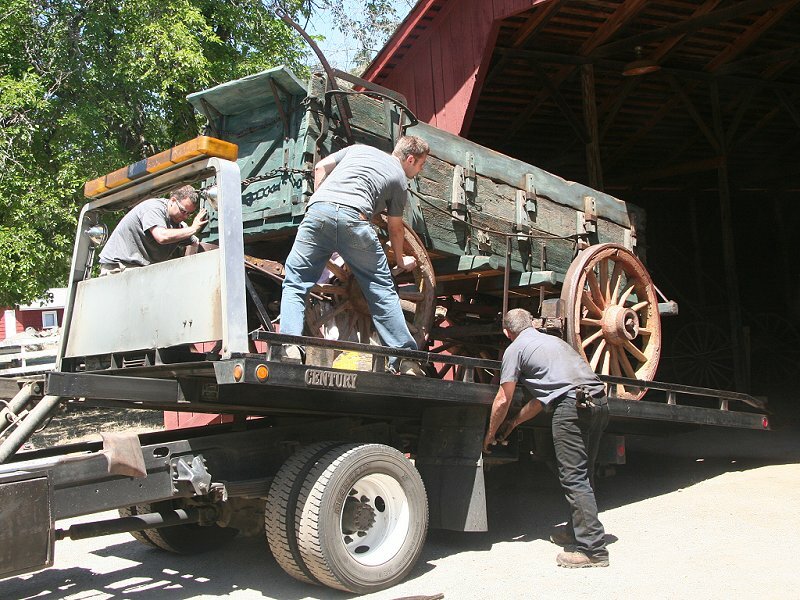 The second wagon arrived about an hour later, after it was transferred to a local tow truck which could navigate Pleasant Valley Road and off load the wagon into the barn, as was the first wagon. The left-brake freighter arrives via tow truck. 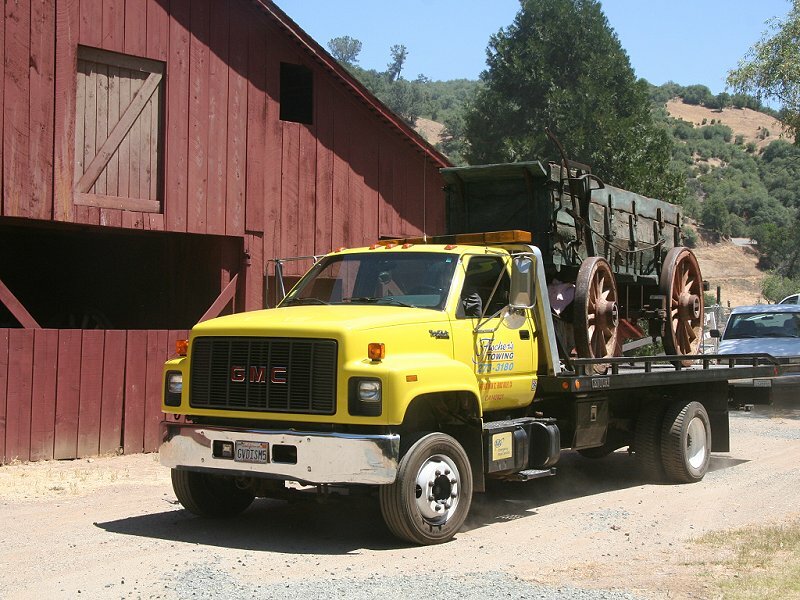 Two members of the California Parks Archives, History and Museums Division follow in the white truck. 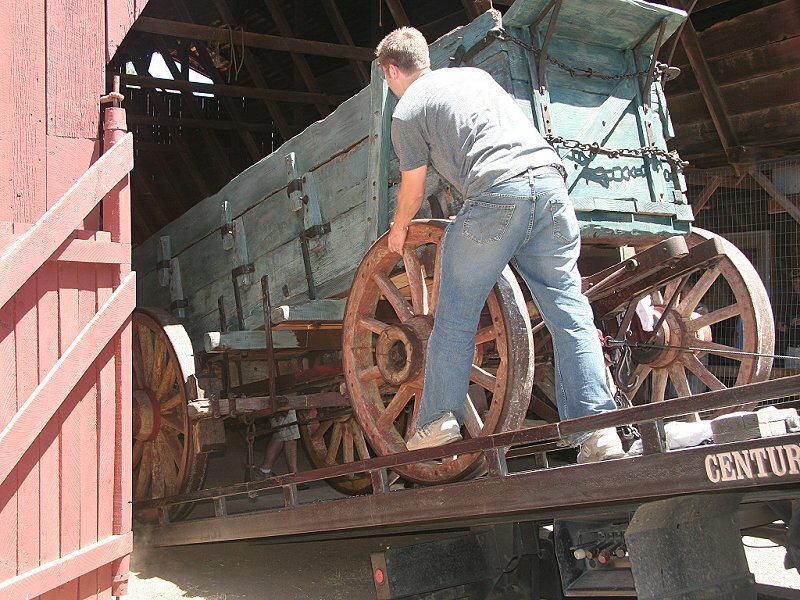 Same wagon, moments following its return to the barn after conservation. The picture was taken from the same quadrant as in the pre-conservation photo. In the picture to the left, you can see that the broken boards have been repaired (or replaced -- the conservation was so well done it's hard to tell just from pictures, but I think I detect that the lowermost side board has been replaced) and all surfaces cleaned. The careful cleaning has revealed many patches of red paint that hadn't worn away with years of service, and the recreated brake shoe has been painted red in patches to match the partially worn appearance of the revealed paint. 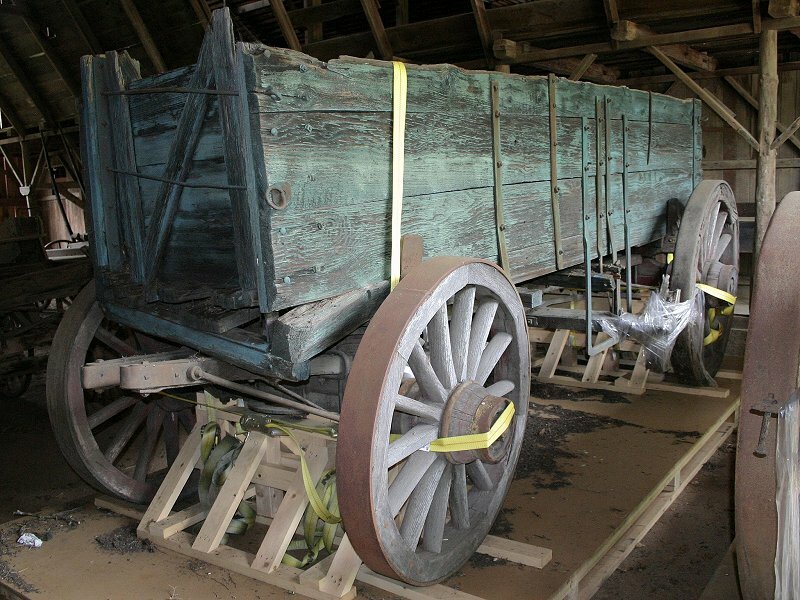 It's now easy to imagine that this freighter was an attractive combination of teal-colored body with bright red wheels, undercarriage, and brake beam and shoes. Teamster pride was just as strong in the 19th century as it is in the 21st. 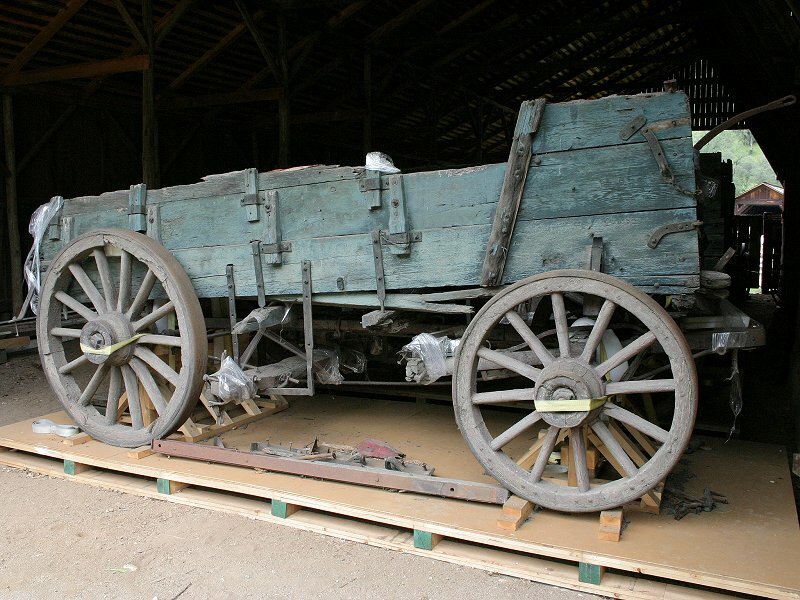 But the conservation process has left the historic wagon as it was found, except for bringing it back into its functional form in reasonable repair. This crop into the front wheel better shows patches of red paint that were cleaned and conserved. Right-brake freighter ready for shipment to Pennsylvania to be "conserved." You can see hints of grime-coated red paint on the inside of the right front wheel (left in the picture). 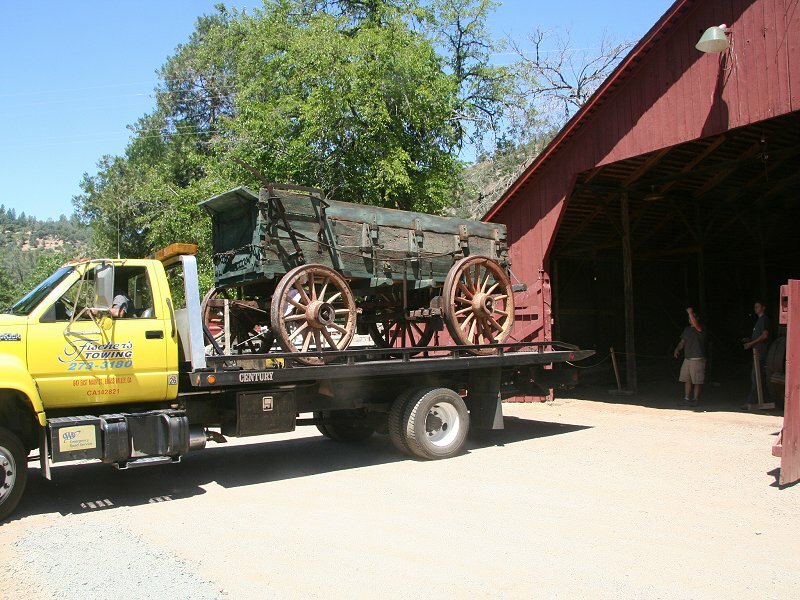 The truck turns into position to back up, as we see more of the Historic Barn. A better view of the freighter is revealed as the truck backs toward the barn. Crop into the above picture to better see the left-brake freighter -- what a beauty! 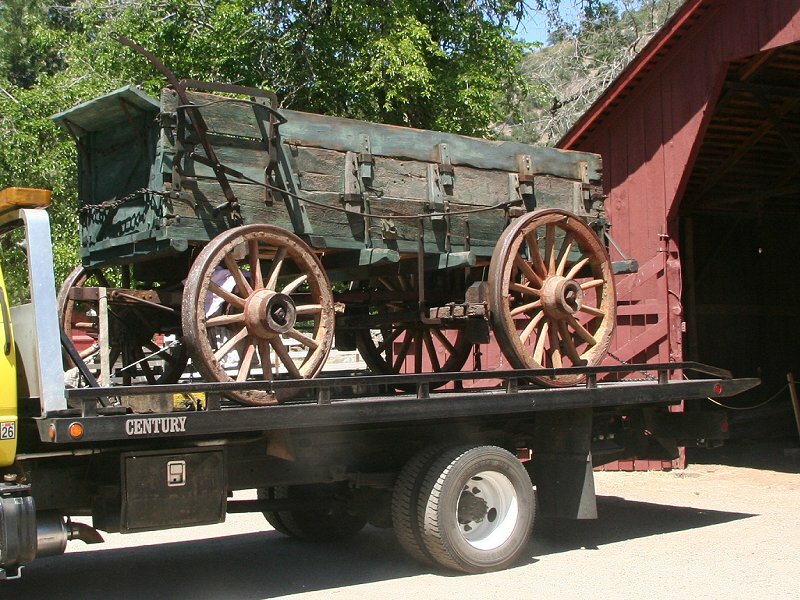 Same wagon on pallet for shipment to Pennsylvania. 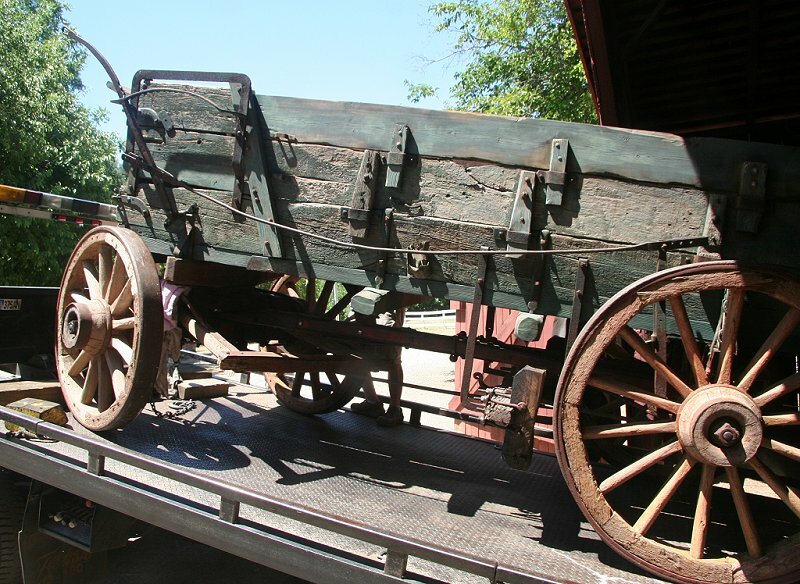 The entire brake side of the wagon has collapsed. Tow truck operator begins to tilt the truck bed to off load the freighter. It's easy to spot replacement boards and stacking pegs by comparing pre-and post-conservation photos. 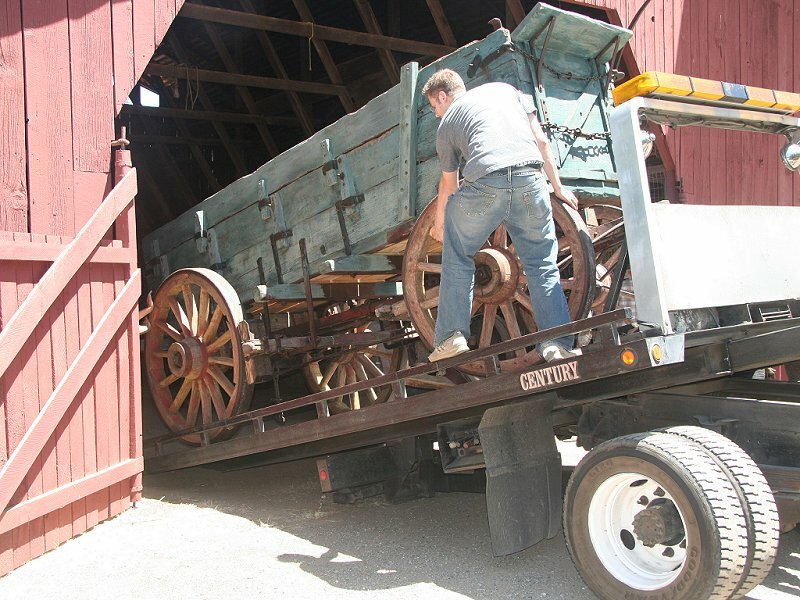 Workers steer the freighter to one side so it rolls into proper position in the barn. Freight wagon with front wheels turned. The new section of top board and its pegs are easy to see in this picture. View from the other side, as the freighter is carefully eased down the truck bed. This side also has a new section of top board, and the front panel and foot rest are probably new as well. >The above picture can be compared with this pre-conserved picture of the same side. 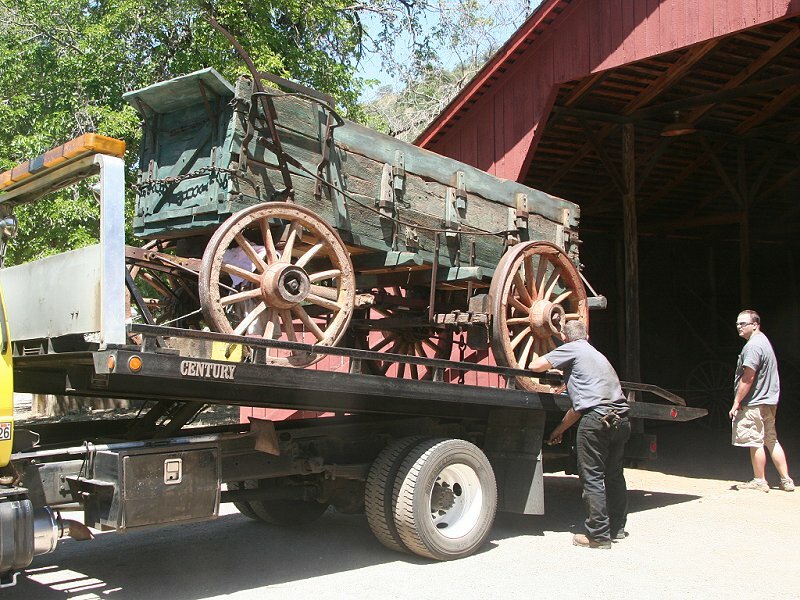 The wagon is now almost in its new home in the Historic Barn.